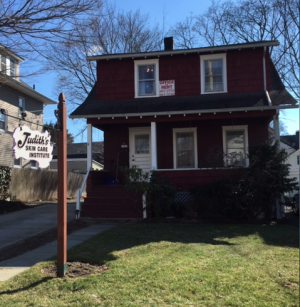 Do You Know What's Going On at 43 Locust Avenue? I parked my car in the rear of the house (have I mentioned the parking lot?!) and rang the doorbell at the backdoor. Judith buzzed me in, and I took a seat in the comfortable waiting area and began paging through this month's Vogue. I barely got through the pre-table-of-contents ads when Judith welcomed me and gave me a top-half coverup, into which I changed. We chatted about my skin and decided on a gentle winter treatment. For the next hour, Judith massaged, cleansed and moisturized my skin. When she finished, my skin glowed, and I felt both relaxed and energized. I can't recommend Judith highly enough. She gives an awesome facial, with expertise, warmth and kindness. I am definitely going again! For more information or to schedule an appointment with Judith, call (914) 967-2752. Just upstairs from Judith's Skin Care is Bon Accord Massage. To reach Bon Accord, I used the front door and was greeted by Linda, who showed me into the lovely space. In the peaceful seating area, I answered a brief questionnaire, then spoke with Linda, who beams with positive energy and sincerity. She explained that I didn't need to choose a massage "type" before starting and that she would personalize my massage as we went along. Not needing to choose one specific massage type was wonderful (I can never choose just one!). Linda then showed me into the beautiful, gently lit massage room, and I instantly felt relaxed. She let me smell several hand-mixed essential oils and choose one for the massage. I changed and got onto the heated massage table. Linda asked if I'd like some music (yes, please), and then she began with calming Shiatsu before moving into of elements of Swedish and deep tissue massage. After an insanely amazing hour, she finished my massage with reflexology on my feet. It. Was. PERFECT. After the massage, Linda explained how much she loves what she does: helping her clients feel their absolute best. I definitely did! To learn more or book an appointment with Linda, call (914) 960-8808. Even with all the good stuff going on at 43 Locust Ave, there is still room for more! Judith has a small space available for lease on the first floor, and Linda sublets her seating room, massage room, and office space (all great for small business owners working from home, who want a safe, neutral space to meet with clients). For more information, call Judith (914) 967-2752 or Linda (914) 960-8808.